When I first came out at 18, there seemed relatively few options for young gay people, other than to go to pubs or discos, of which there was just a small handful in Glasgow. As someone who has always suffered slightly from social anxiety, the idea of standing about in noisy bars or clubs, surrounded by complete strangers was well out of my comfort zone and just made me more nervous and less confident about myself. However, one evening when I visited the Vintners Bar in Clyde Street early in 1980 (now long gone and replaced by an internet cafe and multi-storey budget hotel) I happened to bump into a Gay News vendor and took this opportunity to buy my first copy. I was pleasantly surprised to read the listings section and find out that there were various special interest groups for gay and lesbian people across the country. One that caught my attention was the Gay Outdoor Club (GOC). I had got my first serious road cycle for my 18th birthday and had already started using it to explore the fantastic countryside on the edge of Glasgow. I had also been hill-walking in the Kilsyth Hills and Campsie Fells a couple of times when I was in the Boys Brigade. In my naivety though it had somehow never occurred to me that gay people also enjoyed these kinds of activities. So without delay, I sent off my stamped addressed envelope for more information about GOC – we had no Internet then! It wasn’t long before I ventured out on my first event – a cycle-ride from Edinburgh to Peebles and back in April 1980. The contrast with the gay scene was like night and day – it was such a positive experience to feel relaxed doing something I enjoyed in good company. A few months later I ventured along to my first weekend trip with GOC in Argyll and climbed my first Munro. Since then I have climbed around 160 of the Munros and cycled thousands of miles around the entire country, mostly with GOC and more recently with a younger similar organisation, Outdoorlads (ODL). Being a member of both organisations has also given me the opportunity to try various other outdoor pursuits, like windsurfing, kayaking, mountain-biking and rock-climbing. Having got so much from GOC and ODL, I’ve naturally felt I owed it to give something back to both and over the years have been glad to help both organisations thrive by leading many events – something I continue to do with great enthusiasm and commitment. 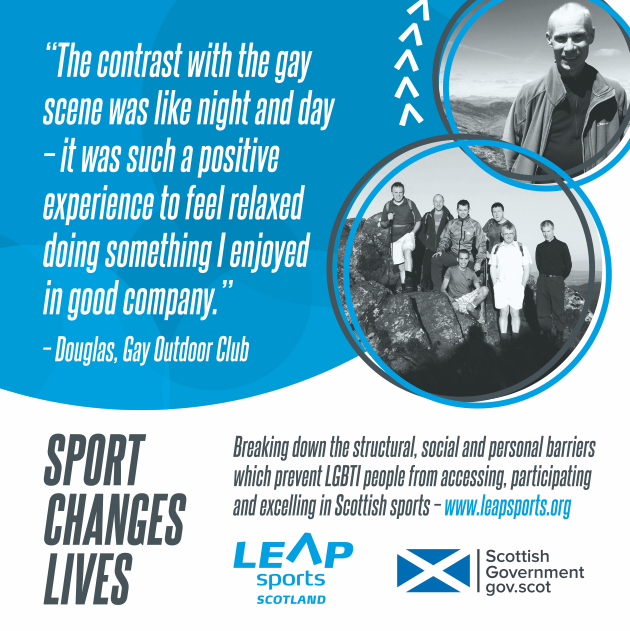 Gay Outdoor Club and Outdoorlads run regular activities across Scotland and the rest of the UK including hillwalking, cycling, day walks, weekend trips, water based sports and much more. Check out their calendars via their websites. Written on 7th January 2017.